You know the usual - ALL opinions are my own and nobody else's. You don't have to like what I say, agree with what I say, or follow what I say, you just have to (somewhat) respect what I say, and I will respect you as well. We all have thoughts and feelings on a specific subject, and we will not always agree on every little thing, but if you can just respect my opinion, then we will get along fine. How about it? It has been about two years since Beckii Cruel last released anything musically that is solely her own, and if you remember way back in October 2011, I did not take too kindly to the remix release of Miss Cruel's English song You Can't Kiss Me. Honestly, I preferred the original, but that is far beside the point, because two years later, three years if you were a fan of Beckii Cruel's Japanese Idol days, she is back with her latest Japanese single, and a documentary to tell you a little bit about the journey she has taken. 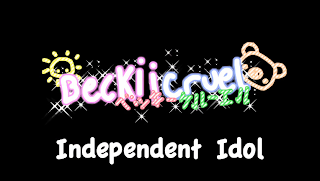 Are you ready to take on Beckii Cruel: Independent Idol? Now, I have not been the most favourable of Beckii Cruel since my days as an Idol fanatic and blogger, and I admit that whole-heartedly, but I recently realised that I have become very welcoming of her return to the Japanese Idol scene since she announced her newest single that I am sure her fans have been greatly anticipating since she broadcast the news on Nico Nico Douga way back when. Okay, so I am still not the biggest fan of Online International Idols, but it is actually nice to see the return of Beckii Cruel after so long. Coming with her return to the Idol scene, Beckii Cruel has actually released a short documentary following her journey back into Idoldom, with added extras, and has been titled Beckii Cruel: Independent Idol. For someone who has learned about documentaries, and enjoyed making her own, I was really interested in seeing this one. To be honest, I actually really liked the first BBC documentary about Beckii Cruel that aired here in England a few years back, so of course seeing this one was a must. Now before I get into the post fully, I know that this documentary and new single will be a touchy subject in a way, but also a lot of fun for others. It all really boils down to how you view Miss Beckii Cruel, whether you like her or not. It also depends on how you take my tone in this post, too, because I know you may or may not take offence to it. In the end, it all falls down to how you feel about what is written here, and how you take to Beckii Cruel as a whole. That said and done, let's take a look at Beckii Cruel: Independent Idol. Shot on the Isle of Man and directed by youtuber Adam Spence, Beckii Cruel's first documentary since 2010 has been released on youtube and focuses on the return of Beckii Cruel as an Idol with her first Japanese single in three years. Now 18, Beckii has been doing various activities in her everyday life as she gets ready to release her new single and return to the Japanese singing scene as a new, Independent Idol. Obligatory walking shot. Nicely done, though! 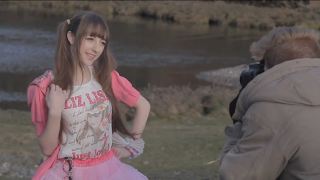 The documentary looks closely at how Beckii got into the dancing and Idol scene before her success as an Internet pop Idol back in 2009 when she was only 14, as well as her return to the music industry after a three year absence since she left the company that she had originally been associated with. Before now, Cruel has kept quiet until the recent announcement of her new Japanese single release, titled Future Fantasy. In the documentary, we not only look into the life of Beckii Cruel, a normal girl and an Internet Idol all rolled into one, but we also take a look at Idols in general and what being a Japanese Idol is all about, and what you are getting yourself into if you decide to become a fan. CGI Sparkles are even popular here in England! Oh my! The documentary itself may seem short, but it is filled with a lot of information and insight into Japanese pop culture, as well as Beckii Cruel's life as a teenage Idol and what was expected of her three years ago, and what is happening now that she is returning. There are many facts present in the video for those who want to understand the Idol industry a little more that are explained well from a Wota's point of view, as well as a lot of focus on Cruel's Idol career, what happened, and what will happen for her in the present and possibly the future. all her fans are drooling over! 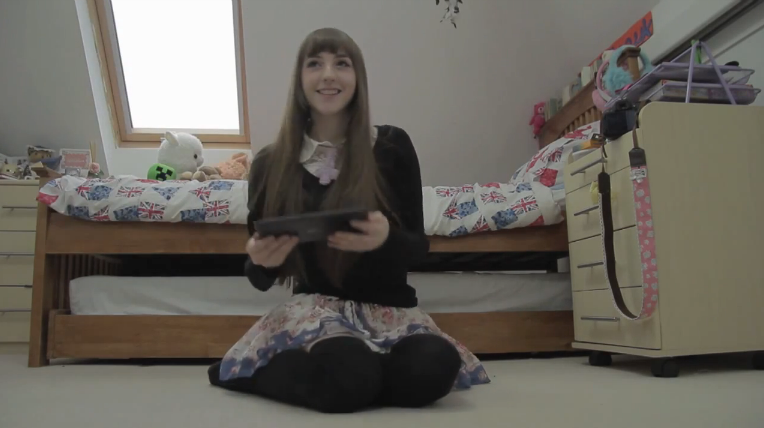 Throughout the documentary, we look at past footage from Cruel's success in Japan back in 2009, her return to the world of Japanese fandom with her appearance at HYPER JAPAN 2012, footage from the recording for her new Japanese single as well as the announcement for her comeback into the music industry on Nico Nico Douga. We also see Cruel talk about being an Idol, hear her parents' thoughts and feelings about her career, and also hear insight from a fan on being a fan of Idol culture and what to expect from it. When I watched the documentary for the first time, I was very impressed with how professional and informative it was. Not only did we take a look into Beckii Cruel as an Idol and her comeback into the Japanese music industry, but we also had great facts about the Idol industry in general and what it is all about, as well as what Beckii Cruel avoided despite her status in Japan as an Idol by releasing a photobook that contained no bikini or underwear shots. 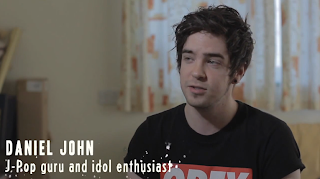 One of my favourite aspects about this documentary was that there was a lot of reference to the Idol industry and what it entails, and how it can be deemed different here in England and other Western countries that are not aware of how the Japanese Pop industry works. As opposed to being focused on solely Beckii Cruel and her return to Japan, the documentary, despite its short 15 minutes and 19 seconds, focused on a lot more and allowed insight and knowledge into what Beckii Cruel takes on as a part of her career, allowing the viewers and new fans of Idol culture to know more about this career, and what we, as fans, are getting ourselves into if we decide to follow Idols and their music. 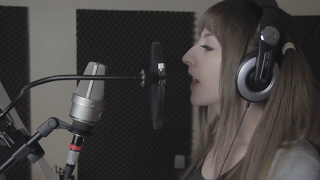 Of course we also look into what has been happening with Beckii Cruel since she has been planning her comeback into the world she was a part of three years ago; we see many shots of what she has been doing, such as an appearance at HYPER JAPAN 2012 and footage of her recording her new solo song that she has released for her fans, but we also get to see what happened before now in the form of past footage of Beckii performing on TV, news clips about her sudden youtube fame as an Youtube and Nico Nico Douga dancer, and hear her thoughts on being an Independent Idol since she left her original company. All of this combined makes an interesting look into Beckii Cruel as an Idol preparing for her return to the world of music and online fandom. Harunan is needed here because I say so! Also, Happy Daishii! There is also a lot of great footage in this video in the form of Hello! Project press releases, and also images that are used, to detail what Idols are about and who their general fanbase is made up of. It was nice to see that there was footage used to backup any information used, as well as to show what a Japanese Idol looks like and what they do. I, however, would have liked to have seen more Idol groups sampled outside of Hello! Project within this short documentary, rather than focusing solely on one group or Umbrella project. I know that in the beginning of the documentary we see AKB48, Kyary Pamyu Pamyu, Perfume and Weather Girls with their popular song releases, but only a few seconds of these clips are sampled, and as a fan of various Idol groups and singers, I find that adding different groups' press release events and images would have given a lot more diversity and introduced newer fans to other groups, as well as given a broader spectrum of different Idols and groups within Japan. That said, it would have been nice to have heard even a small explanation about how all Idol agencies and groups in Japan work differently from each other, and that Idols have different looks, characteristics and themes that work in their favour. Given the duration of the documentary, however, they do explain a lot and let us know what we need to know, but I feel that whilst Hello! Project as a whole is a good example, and one of the most iconic groups of Japan internationally, there could have been one or more other groups outside of the Up-Front Agency shown in this documentary. Also included in the documentary is a brief look at Beckii Cruel and the internet hate she receives from various online articles and internet users, something that many who venture online will know about (whether you partake in it or are a victim of it). Whilst the scene is only brief, we see Cruel express her feelings towards the comments she receives as well as how she handles it and what she thinks of the comments overall about her return to the world of Japanese Idol music. 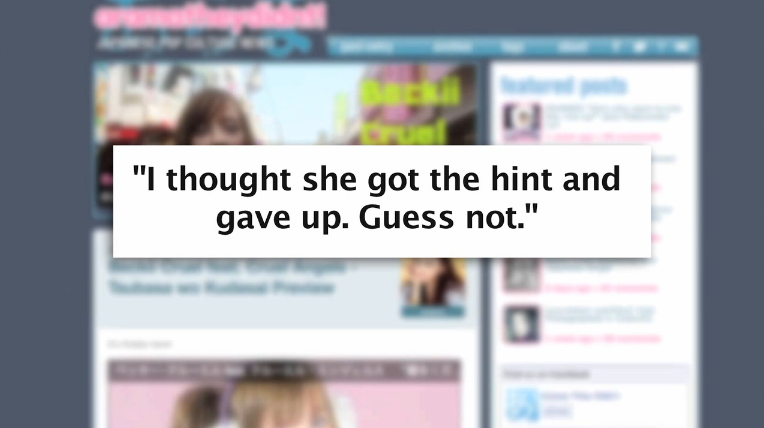 Looking at that scene, I originally thought that it was not the wisest of choices to include the site in the documentary through ways of a blurred picture (no matter how notorious said site may seem), and I still wonder why it was included, however I do think that Cruel handled herself well when talking about how she deals with the hate comments and her thoughts on them, and how she has overcome trying to defend herself in recent years. The scene itself may not have been that necessary for some when watching it, however I do think it was a pretty good addition to the documentary to show just what being a Japanese Internet Idol from an International background can bring in terms of negative backlash from fans of Japanese Idol culture, as opposed to simply showing all of the positive footage of Cruel as an Idol. Beckii Cruel: Independent Idol looks into the life of Beckii Cruel as she returns to the world of being an Idol, and the preparations she has undertaken in order to return to the world that she was a part of three years ago. Looking at this documentary as both a fan of Idols and someone who has an interest in documentaries and media, and Beckii Cruel herself, I think that this is a good look at both Beckii Cruel as a returning Idol, and a great way of finding out about Idol Culture and what it has to offer for fans, and what we should be prepared for when going into a fandom like this. The video, though short, has a lot to offer, and whilst there are things that I would have like to have seen more of, such as information on various Idol groups and different clips from different Idol Units within Japan, I do think that what we have here in this 15 minute documentary is a great look into not just Beckii Cruel's life as an Idol, but Idol Culture in general. This documentary is the start of Beckii Cruel's return to the Japanese music industry as an International Idol. Since her departure from the world of Idols three years ago, she has matured and grown as a person, and is ready to return to the music industry, starting now. This video only shows a small part of what Beckii Cruel has been doing in order to prepare herself for a return to the world as an International Idol, but it offers us a lot in the form of information and insight into Idols and the fandom we are a part of. We see what we need to see, we hear what we need to hear, and it is all packaged in a beautifully filmed and edited documentary that is an enjoyable watch. "What's next? I can't predict the future, really. A lot of the things which I've done in the past, you just can't predict what's going to come next. You can get this amazing offer, or maybe nothing will happen at all. It's very difficult to say, and I don't want to spoil it by guessing, so I'll just wait and see." - Beckii Cruel (then 17) from Beckii Cruel: Independent Idol. Are you ready for the return of Beckii Cruel: Independent Idol? I love documentaries, so a documentary about an idol really got me excited! :) I enjoyed it at first, but then they started going into the parts about idol culture in general, and describing things like gravure in detail. And I was just like "How does this relate to Beckii Cruel?" I mean, it would've been cool if it was in a documentary about idols, in general. But it wasn't. I felt like we were missing out on a lot of things about Beckii that could've been talked about, and felt rather bored listening to them describe things about idols that I already knew. So basically the first half of it was GREAT, but the second half... not so much. Ah, I have a documentary buddy! WOOHOO! To be honest, it is nice to see a documentary on an Idol, especially an international one because we can understand it better! To be honest, I think the parts about Idol culture are in there to aid along new fans of Beckii Cruel or to help those who are only on her youtube for the dances to understand what she does. I doubt everyone watched her first documentary with the BBC, and there were possibly things she couldn't add in there that she wanted, because as far as I know, she did not edit it at all, she was just the interviewee in a sense. I think that they explained it to back up why Beckii didn't do it in the first place. They mentioned she was the first in her company to not do gravure shots, and honestly, I do think it needed a bit of explanation behind it about what it was to see why Beckii and her parents had refused to do that sort of thing.